In the best case scenario, a limited U.S. pre-emptive strike on a North Korean missile launch site or nuclear facility would not seriously degrade its capabilities, but may convince the country's leader, Kim Jong Un, to seek dialogue rather than risk a war he knows he cannot win, analysts say. “If he stays patient and tries to find an exit through negotiations with the U.S., using China and Russia, he may stay alive,” said Shin In-Kyun, a regional security analyst with the Korea Defense Network in Seoul. However, the very justification for military action to eliminate the North's nuclear threat is that the aggressive leadership in Pyongyang cannot be counted on to act with restraint. “There seems to be a disconnect between saying Kim Jong Un is crazy and might launch an attack, but he would be rational enough not to respond to a U.S. attack,” said Bruce Klingner, northeast Asia analyst at the Heritage Foundation in Washington and a former CIA intelligence analyst. FILE - An aerial view of U.S. Naval Base Guam taken Sept. 20, 2006. 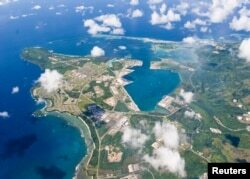 The risk of military conflict between the United States and North Korea continued to intensify after the North Korean People's Army released a statement Wednesday saying it is “carefully examining” plans for a missile strike on the U.S. Pacific territory of Guam, the site of a U.S. military base that hosts a submarine squadron, an airbase and a Coast Guard group. Just a few hours earlier, U.S. President Donald Trump said North Korean threats would “be met with fire and fury like the world has never seen,” while speaking to reporters at his golf club in New Jersey. The Trump administration has repeatedly warned that North Korea's continued efforts to develop a long-range nuclear missile that can target the U.S. mainland constitute an unacceptable threat. But while the use of force remains an option to deal with the growing North Korean threat, senior officials have said they are focused on global diplomatic action, including sanctions. The U.N. Security Council unanimously imposed new sanctions on North Korea on Saturday. Pyongyang says its nuclear and missile programs are needed to defend against the perceived threat of a U.S. attack. U.S. intelligence sources are now assessing that North Korea has produced a miniaturized nuclear warhead, according to multiple news organizations. While still untested, this new breakthrough would bring Pyongyang one-step closer to developing a nuclear strike capability against the U.S. mainland. 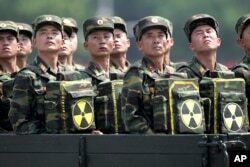 FILE - In this July 27, 2013, file photo, North Korean soldiers carrying packs marked with the nuclear symbol turn and look towards leader Kim Jong Un during a military parade in Pyongyang, North Korea. North Korea recently warned it would teach the United States a “severe lesson” by responding with nuclear weapons to any U.S. military action. But military strategists say a limited strike would more likely provoke a deadly North Korean artillery and possibly chemical weapon attack against South Korea, which could escalate into a major conflict along the heavily militarized inter-Korean border, and draw into the fighting the over 28,000 American troops in the country. North Korea has the capability to fire 300,000 artillery rounds in the first hour of an attack that can reach half of the South Korean population, including the 10 million people living in Seoul. A more extensive attack to target all of North Korea's missile and nuclear facilities would likely have to include contingencies for a full scale invasion of the country. “To guarantee that you have eliminated all of North Korea's nuclear and missile capabilities really would require an end to the North Korean regime,” said The Heritage Foundation's Bruce Klingner. In the end, military strategists say U.S. forces would prevail in a war with North Korea, but it would devastate the region and likely cost of millions of lives. 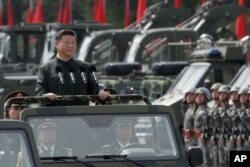 There is also a real possibility that Chinese leader Xi Jinping would order his military to fight for its ally in Pyongyang to prevent the United States from taking control of the North. “Any kind of major conflict outbreak would see Chinese intervention in the North and then we would have to be very careful not to wind up in a major war with China,” said Bruce Bennett, senior defense analyst at the Rand Corporation research organization. South Korean opposition and resentment against the United States would also likely surge if Washington starts a conflict that endangers the lives of millions near the border. But Shin In-Kyun with the Korea Defense Network said the U.S.-South Korea military alliance would remain intact, as Seoul would have no choice than to side with Washington in order to survive.